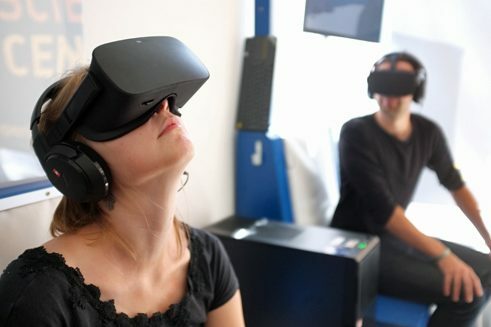 At the Game Science Centre in Berlin, visitors can take a look at the future and try out what will be shaping our everyday lives in the years to come – for example, virtual reality. The new technologies are also interesting for libraries. It is not exactly quiet at this exhibition. On the contrary, all sorts of sounds can be heard: bleeping, electronic music and the laughter of visitors who are just testing an installation. A young woman produces melodies by dancing in front of an infrared camera. Children hold their hands over a sandbox as if they were clouds and let it rain – virtually, of course. There are visitors sitting around at the entrance wearing those bulky virtual reality glasses, experiencing adventures in digital worlds. VR glasses, which have been in use at the “Zukunftsmuseum” since the exhibition first kicked off, are particularly popular. Museum visitors can immerse themselves for five minutes in virtual worlds. VR glasses produce two stereoscopic, partial images right in front of one’s eyes, which are then merged by the brain into an overall image with a strong depth effect. You also feel “in the midst” of the action, because the system – consisting of camera and glasses – registers the head movements of the user. Visitors have the choice between real film footage, animated short films and music videos, ranging from a trip in a virtual submarine to a poetic interpretation of Saint-Exupéry's The Little Prince. Every day Cyrill Etter experiences the enthusiasm that VR inspires among museum visitors, and considers the technology to be absolutely revolutionary. “I almost equate it with the invention of television.” VR is already being used in many areas of life: in films and computer games, in journalism, tourism, architecture and medicine. As Etter says, he is convinced that libraries can also benefit from VR, for example, when it comes to teaching history. “If somebody wants to know what life was like in ancient Rome, VR can put him or her right in the centre of the action.” Thanks to the immersion approach, even current political and social issues can be explained much more directly than via classical media. In the VR workshop, interested visitors are able to test various applications and games, such as the Tilt Brush program, which can be used to draw three-dimensional images in virtual space. The marine simulation TheBlu and the Job Simulator are also popular, says workshop manager, Philipp Bültmann. “It shows very clearly how the controlling systems work in VR.” The workshop participants can also see the images the VR glasses wearer is looking at on a large screen. The programs available at the Cologne Municipal Library show that, even in this digital age, in which the Internet is the main provider of information, libraries are becoming increasingly important locations, where people can share their ideas and learn together, find inspiration and try out new things. A new technology, such as virtual reality, plays two roles – on the one hand, it is a medium for the transfer of knowledge and the exchange of ideas, but, on the other, it is also something that people have to learn how to deal with. However, the use of VR glasses is an organisational challenge. In this respect, the Game Science Centre in Berlin has gained valuable experience. The glasses have to be disinfected and re-adjusted for every user. In the meantime, the GSC has not only developed routines that significantly reduce the amount of maintenance and the number of personnel required, but it has also developed a special armchair for the use of VR glasses in public facilities. In terms of costs, these routines really are really most relevant to libraries. Hannelore Vogt attests to the great potential VR has, “especially in the medical field”. 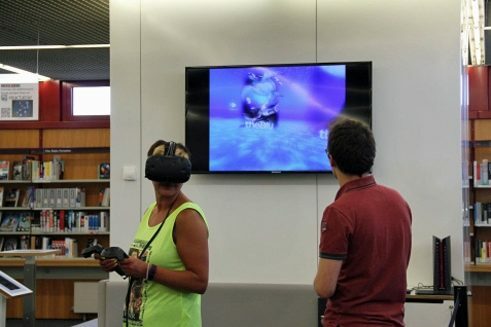 This is why the Cologne Municipal Library has introduced an introductory course in VR brain training, particularly beneficial to older users. In addition, workshop participants learn how to program simple virtual reality worlds themselves. “It is important for us to talk to these people”, emphasises Vogt. “We want to discuss the impact that VR has on the way we live and work.” However, new technologies also have practical benefits for libraries; Ms Vogt can well imagine replacing the high-maintenance touch screens of the catalogue search engines with gesture control cameras. Visitors to the GSC in Berlin are already able to try this out. Achim Fehrenbach works as freelance journalist in Berlin for „Spiegel Online“ „Zeit Online“ or „Der Tagesspiegel“. His focus is above all on technological issues and computer games.